That’s the case made by Malcolm Knox’s column in the Sydney Morning Herald today. Kyrgios is representing Australia in their Davis Cup, most recently defeating American John Isner in straight sets, which might have been what prompted this highfalutin seminar in sports nationalism. I have not bothered to write about Kyrgios in this column previously. One thing he and I have in common is that neither of us is all that interested in tennis. But Kyrgios is the chump; he’s the one trapped in it. The rest of us can walk away from this most pointless of corporate advertising vehicles, but he is snared by his own prodigious talent, poor dear, and can’t break out into his preferred professions of basketballer, car salesman or gentleman of leisure because, bless his cotton ankle socks, he is, like his heroic forebears in the land of Homer, cursed by too much talent. Kyrgios’ talent is such that, in spite of his best efforts, he is on a path to fulfilment. His results this year suggest he is not only unable to avoid the destiny that his natural gifts bestow but is also luckier than he deserves, rising to the top just as a lot of tall timber is falling around him. Roger Federer and Rafael Nadal are enjoying an Indian summer before they take their leave, and behind them, the Djokovic-Murray generation is showing signs of burnout. Kyrgios’ time is nigh. 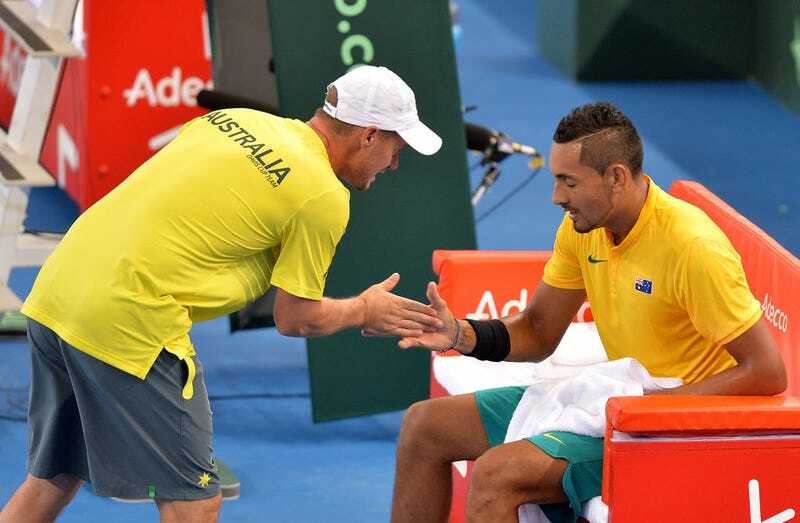 Now for Australia to ask itself: will on-court success whitewash their reservations about Kyrgios’ personality? Should he reach his potential and begin winning major tournaments, will Australia forgive him (or script for their own absolution and willed amnesia), and rewrite the past as a story of perfectly understandable youthful indiscretion? Will the Davis Cup – a green-and-goldwash of reputation-laundering – be Kyrgios’ avenue to redemption? Shame on you, Australia, for even contemplating it.